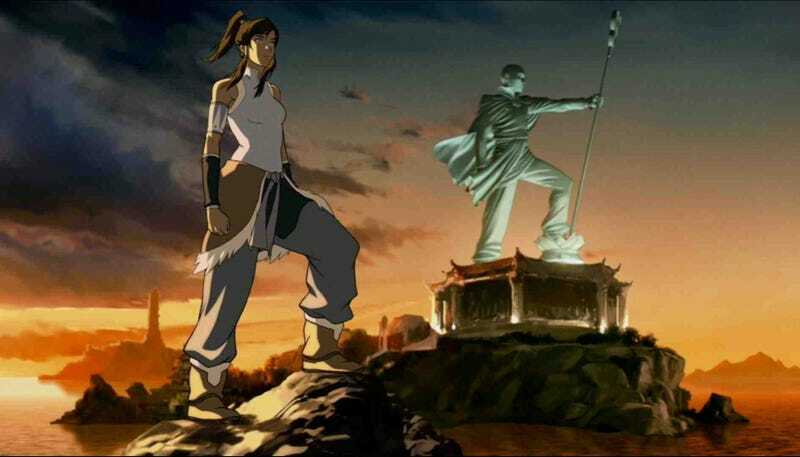 Exactly a week ago from today, fans of Nickelodeon's The Legend of Korra tuned their TV sets - for the last time - to see Korra's elemental-bending friends have an epic battle with Book Three's (that's Season 3, for the uninitiated) main villains (who each individually can bend one element, including their leader Zaheer who suddenly gained airbending abilities and his apparent girlfriend, a "combustion bender") as they were almost successful in kidnapping Korra herself. If it sounds exciting, that's because it was, and demonstrates why this series and its predecessor, Avatar: The Last Airbender was so popular with people of all ages. In some ways, it's an appropriate ending for the series. Yes, the series will continue, but only online. No, despite whatever way Nickelodeon tries to spin this, this isn't ultimately good for the fans, or fans of multi-media entertainment period. This is hardly the first time Nickelodeon's done something this egregious either, as a quick glance at their recent history shows. In fact, it really does start to beg the question if there's something fundamentally flawed with Nickelodeon's current management. Topshot courtesy of Nickelodeon, used under Fair Use claim. Nickelodeon dates back all the way to 1979 (just predating rival Disney Channel) as one of cable's first dedicated children's networks, but really came into its own in the 90s. Like MTV of the same period, the network found huge success and identity with a demographic now identified as part of the (younger) Gen X'er and (older) Millennial crowds - demographics that are identified as highly lucrative today, but were just as lucrative for Nickelodeon back then (only with permission to use a parent's credit card). Shows like Invader Zim, Salute Your Shorts and the myriad of game shows (such as Legends of the Hidden Temple) and sketch comedies (namely All That, which we'll get back to later) became highly influential with many of today's content creators (both aiming squarely at children and otherwise) and are fondly remembered by fans (likely including yourself) who saw the original runs or were exposed after-the-fact from word-of-mouth. Invader Zim, because Invader Zim. From the Invader Zim Wikia. Disney Channel's content was, in comparison, soft (it certainly had favorites that can compete head-to-head in the nostalgia department, most notably Chip and Dale's Rescue Rangers, Duck Tales, its spin-off Darkwing Duck and the deliciously dark for a kid's show and storytelling/mythology-rich Gargoyles, but was hampered by having all of these shows freely syndicated in broadcast) and was more or less seen as a "kiddie network" even among kiddie networks, while Nickelodeon seemed to have the precious tween and teen demos locked (especially regarding males). Even as Disney Channel's prominence rose, Nickelodeon only rose with it, or at least was able to stay even or just slightly ahead. Disney Channel found critical and ratings success at the turn of the millennium with single-camera live action shows such as Lizzie McGuire and with both male and female demographics in Even Stevens (also giving us Shia LeBeouf in the process) and Phil of the Future, but it didn't start to take away from Nickelodeon's dominance until they started pumping out cheap, multi-camera laugh track-infused "kidcoms" that banked on high concepts and star power starting with That's So Raven and then with The Suite Life of Zack and Cody and especially with a little thing called Hannah Montana. Back at Nickelodeon, All That creator Dan Schneider tried his hand at sketch comedy a second time with The Amanda Show; it didn't just replicate his first success but exploded in popularity and birthed a lineage that just now is winding down. All That stars Kenan Thompson and Kel Mitchell got their own sitcom, Kenan & Kel (also helmed by Schneider) while Jaime Lynn Spears starred in what would end up being Schneider's first and only single-camera Nickelodeon sitcom, Zoey 101. Likewise, Amanda Show alumni Drake Bell and Josh Peck starred in Drake & Josh (yet another Dan Schneider creation). Their co-star Miranda Cosgrove seemed ready to be able to tackle a starring vehicle on her own, and as Drake & Josh wound down, Nickelodeon was searching for its own Hannah Montana. Schneider came up with the concept of a show centered around a girl who instead of hiding from fame through a secret identity would gradually earn it with her friends through a goofy sketch comedy webshow and simultaneously capitalize on the growing popularity of what was still a new phenomenon called YouTube. Thus iCarly was born - and the low-concept kidcom on Nickelodeon effectively died. Schneider followed up on iCarly with VicTORious (the mid-word capitalization emphasizing the main character, Tori Vega, played by Zoey 101 costar Victoria Justice) about a clique of students attending the elite Hollywood Arts school for gifted children (leaning towards performance arts, namely music). VicTORious is often compared to Hannah Montana in that it was likened to a "pop music factory" selling Nickelodeon-produced tunes as much as it was air time, as well as the extremely similar Shake it Up and A.N.T. Farm shows on Disney Channel (the main differences being that Shake it Up follows high school students who also happen to be performers on the eponymous dance showcase program; while A.N.T. Farm follows a nearly identical premise to VicTORious, its plotting and writing was more focused on the type of prop/sight gag and pun-based "Wacky Hijinks" humor considered appealing for the early tween demographic or even younger). Victorious and iCarly were also joined by single-camera production Big Time Rush, concieved by Ned's Declassified School Survival Guide and Cartoon Network's Johnny Test creator Scott Fellows and more or less The Monkees updated for the 21st Century; and How to Rock, a multi-cam sitcom based on the mildly popular young adult novel How to Rock Braces and Glasses about a high school "queen bee" who gets dethroned and tries to reclaim her popularity (with Nickelodeon adding a celeb star-themed high concept angle, for good measure). Although Nickelodeon continued to skyrocket into family households (typical iCarly viewership, for example, was 5 or even 6 million per episode) its lead over Disney Channel rapidly eroded and disappeared. Disney Channel beat Nickelodeon at its own game of turning teen girls into household names and into super-stardom, not just with Miley Cyrus' Hannah Montana but with Selena Gomez's Harry Potter cash-in Wizards of Waverly Place, Demi Lovato's Sonny With a Chance (itself accused of being a blatant rip-off of iCarly down to rumors of Disney literally stealing one of Schneider's early pitches of the show), the aforementioned Bella Thorne and Zendaya vehicle Shake it Up and to a lesser extent China Anne McClain's A.N.T. Farm. These were later joined by Suite Life on Deck co-star Debby Ryan's own Jessie (very, very loosely autobiographical while mashing in The Nanny with Ryan playing a Texan teen looking to make it big in the Big Apple and taking a nanny job for a wealthy family in the meantime) and the Ross Lynch and Laura Marano duet Austin & Ally (about a singer-songwriter duo making it big in the Miami music scene Justin Bieber-style). Oddly enough, one of Disney Channel's biggest successes was Good Luck Charlie starring Bridgit Mendler about a Denver-based family...and that's pretty much it. With Leigh-Allyn Baker playing part-time nurse Amy Duncan and Eric Allen Kramer as bug exterminating dad Bob Duncan, there was little glamorous fantasy in the life of Mendler's Teddy Duncan other than in her literal dreams. It was the first low-concept Disney Channel show since Lizzie McGuire and Even Stevens and it ended up being a ratings mega-hit, helping Shake it Up carry the network's Sunday lineup. When iCarly aired its final episode, iGoodbye in November 2012, it would prove to be the end of an era not just for Nickelodeon but for both networks, through viewership forces still very poorly understood today. Nickelodeon filled iCarly's timeslot with Marvin, Marvin, a Lucas Cruikshank (better known as Fred) vehicle about an alien on the run from intergalactic invaders being sheltered by an Earth family. It promptly became a ratings flop. Meanwhile, How to Rock was abruptly canceled despite strong ratings and no official explanation, although rumor states it was done to make room for a future lineup more focused on Dan Schneider creations (which we'll get to in a bit). Most surprisingly and confusingly of all, Nickelodeon declined to finish the backorder on VicTORious' third season, cutting that show short of its expected iCarly-like run. As these made the typical Variety and Deadline Hollywood headers, the plugged-in and media news-savvy audiences caught on immediately, and as if either in protest or in acknowledgement that the end was nigh and ready to make things moot, ratings started to plummet. It is also rumored that Schneider had planned to run no less than three shows concurrent. One would've been VicTORious, with the other two being spin-offs of both that show and iCarly - Gibby, starring the titular iCarly "break-out" character played by Noah Munck, and Sam & Cat starring iCarly's Jennette McCurdy and VicTORious' Ariana Grande reprising the respective roles. With VicTORious' surprise cancelation and Gibby being declined past the pilot stage, this left only Sam & Cat - and an otherwise very empty line-up. Sam & Cat's premiere was kicked forward to the summer of '13 and would be joined by Wendell & Vinnie, a more adult-oriented sitcom starring Drake & Josh and iCarly costar Jerry Trainor that many speculated was meant for Nickelodeon's Nick @Nite block. Whether it be because of the more adult humor, or for other reasons, Wendell & Vinnie bombed and left Sam & Cat as the very critical centerpiece of what remained of Nickelodeon's live-action lineup. Sam & Cat would be yet another premature cancellation on Nickelodeon's part, and probably the one they needed least of all. Ordered for an extended 40-episode season, the show would ultimately produce only 36 before being quietly put on "permanent hiatus." While many outlets (including our own Gawker) reported on Jennette McCurdy's leaked lingerie selfies as being a potential cause, the reasons for the show's cancellation are at once both complex and obviously simple. There were persistent rumors that co-stars McCurdy and Grande fought constantly behind the scenes; most bizarrely of all, McCurdy failed to show up at Nickelodeon's 2014 Kids' Choice Awards despite having her show be nominated for best comedy (ultimately winning against Jessie and even The Big Bang Theory) and herself being nominated for best actress (which ended up being awarded to Ariana Grande). McCurdy an the network itself also dropped hints of the show's unusual 40-episode one-season order and the consequent rushed production exhausting the stars. Though a bone-headed move in hindsight, there are legitimate reasons why Nickelodeon made this decision: at the height of his popularity with the network, Dan Schneider commanded insane influence and clout to the point where iCarly's Miranda Cosgrove commanded over $200,000 per episode, effectively making her "minute-for-minute" the highest paid actress in Hollywood (making over twice as much as Modern Family star Sofia Vergara and far, far distancing Vergara's co-star and Cosgrove's peer Sarah Hyland, for example). In order to make the show affordable, episode production orders were stretched out to the point where there would be a new iCarly episode once per month. It's likely Nickelodeon wanted to double down on as many Sam & Cat episodes early, while the show was at its cheapest. Either way, a behind-the-scenes legacy of bloat and over-clout combined with falling ratings (Sam & Cat falling to 2 million viewers flat at one point in late winter '13 and rarely rose above the low 3 million viewer range since) makes the cancellation far less scandalous than what McCurdy's selfies and off-screen behavior suggest. Meanwhile, Legend of Korra was as much the success as people expected - and yet Nickelodeon still failed to give the show the respect it deserved. This culminated in the bizarre promotion of Book 3's episodes available only on the network directly, denying viewers the ability to "see the online" (unique to Korra only, with everything else being streamable from Nickelodeon's website for free including the ultra-low-budget-to-the-point-of-The Room-weird multi-cam production Every Witch Way) only to turn around and proclaim them viewable only online, and in turn proclaiming this as a somehow triumphant re-alignment of Nickelodeon's programming. Yes, it's true that online streaming seems to be the way of the future, but networks still operate on the two principals of maximum exposure and sellable airtime. As it currently stands, networks are still struggling to figure out how to turn online streaming into sellable airtime, and reducing the number of channels available for viewership certainly works counter-productive towards the goal of maximum exposure. Korra's treatment by Nickelodeon is particularly puzzling given its ratings success and marketing and PR gymnastics, but it wouldn't even be the first time Nickelodeon has pulled that off this season with other shows. Sudden cancellations of popular shows (that Nickelodeon made massive investment and hype in), random schedule changes, renegs in established contracts - all have been par for the course in the modern era. It's inconceivable how Nickelodeon's current management can be described as "good" or "smart," but given the legacy they have to deal with (namely, the over-bloated excess of control they gave to Schneider at his height in power) it may have been a dead-end they've been walking towards for a good while already.